Remember that there are usually a few models of the home for sale. 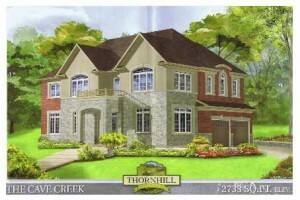 The show home is traditionally going to be the largest one. It may be difficult to imagine the difference between a 2,200 sq. ft. house and a 2,800 sq. ft. house visually. However, the 600 sq. ft. difference is going to be noticeable. Nowadays it is normal for a condo studio in downtown Toronto to be about 350 sq. ft. A one-bedroom apartment is about 500 sq. ft. That is the difference that there might be between your show home and your actual home. A show home is typically upgraded. This makes up anywhere between 10 to 20 percent of the builder’s profit margin. There are nice granite countertop, stain and steel appliances, nice kitchen cabinets, back splash, hardwood flooring throughout the house, central air conditioner, a deck, stairs, and much more – those would be considered upgrades. Be prepared for the builder to ask double for every upgrade. Buying a granite countertop from the builder will cost you $8,000 for example. You can ask for a discount for that countertop, hoping to install that countertop on your own, but the discount would be about $2,000 for that countertop. If you are not buying the model home, do not assume that the floorplan is 100 percent accurate. There is fine print in the builder’s agreement, which can be extremely difficult to decipher without a real estate professional. The builder is legally able to make some significant changes in your floorplan, thanks to the fine print here. It might be possible for them to reduce the size of your home by 10 to 15 percent, without ever notifying you. This could be the difference between having a walk-in closet and having to settle for a normal closet. If you take just 10 percent of 2,200sq. ft. it should tell you how much you could lose out on. Remember that the pictures in a neatly printed brochure are “for illustration purpose only.” Again, this is fine print. You will always see the home separate from other homes in the brochures. There are trees and everything looks isolated. In reality, your neighbor’s home might be close enough to where you are unable to look outside and see anything other than your neighbor’s walls. Do not simply fall for pretty pictures. Understand and try to picture the size of your lot. It might be extremely challenging to resell the house if it is very expensive, but does not have a great backyard.